Well, today a friend of mine asked me to do the Allegan Antique Market this Sunday. I agreed and in four hours had all my things priced, furniture loaded, and was off to load it into her trailer! SO come see us THIS SUNDAY! booth #137! To check out her blog click here. 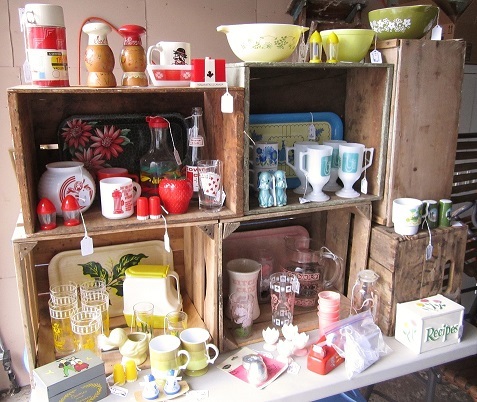 So, there is a 15ft trailer and 3 carloads full of vintage stuff happening in our booth! Furniture, linens, housewares, that dare I say you probably won’t be able to live without, and great prices I might add! I just can’t stop running into the most amazing vintage things! From little items I sell in my vintage shop, click here, to furniture pieces that I’ve slowly added to my home. Check out these recent acquisitions! 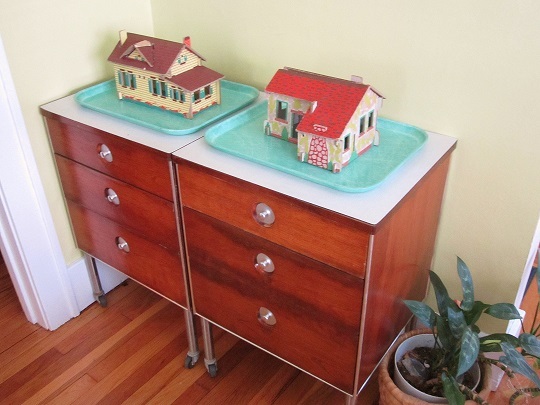 Amazing little medical cabinets, with metal drawers-wood sides-and formica tops, plus these 2 little puzzle houses from the 50s. I’ve never seen these before and am going to have to do my research on them. I just added this to the corner of my dining room and I couldn’t love it more! It’s finally here! The first official summer weekend was fantastic! Farmers market, a few good yard sales with vintage, yard work, dinner in the garden with friends, saw the Sign Painters documentary which was so awesome, and FYI the book is out too. I caught up a bit with one of the directors, Faythe Levine, which I know from my artgoodies gig. Her shop Paper Boat Boutique in Milwaukee, which has since closed, was the first place outside of Grand Rapids that I started working with almost 7 years ago. It was a pivotal moment in artgoodies history and I still can’t thank her enough. Then a fun wedding shower today, and I actually laid in the sun and read part of a book-amazing! Of course, I still worked both yesterday and today, because let’s face it, that’s how I roll. So no travel on the books again this summer which is strange and different yet again. However, this summer I have no magazine photo shoot to prep for and I’ve settled into the rhythm of working with a few larger companies, SO hopefully I can find a relaxing balance this summer…maybe? What summer dreams are made of. Dinner in the garden with friends. 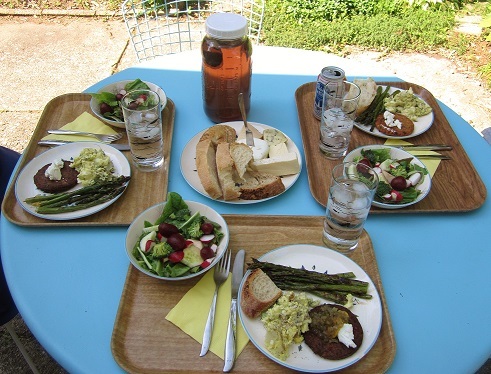 Fresh grilled asparagus, homemade fennel potato salad, grilled veggie burgers, salad from my garden with local veggies, local bread and cheese, and sun tea! Yay for summer, the farmers market, gardening, and time with friends! 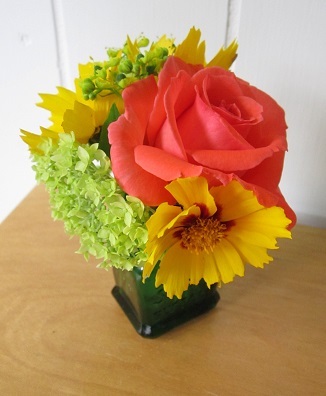 Sweet tiny little bouquet from my garden. 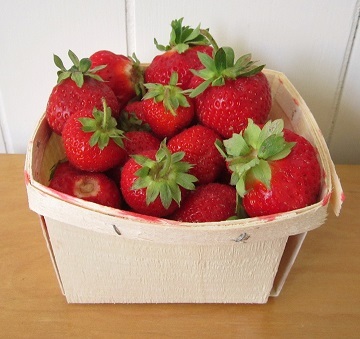 Strawberry season, short lived here but so good! 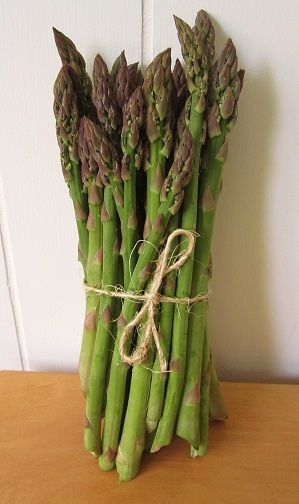 I cannot resist buying fresh asparagus from the market stand that ties a little twine bow around the bundles! Wow, the garden is growing and looking great! Here are a few pics for ya! Here's a basket I picked up at a sale. I got some coir and made a little nest for these gorgeous geraniums. 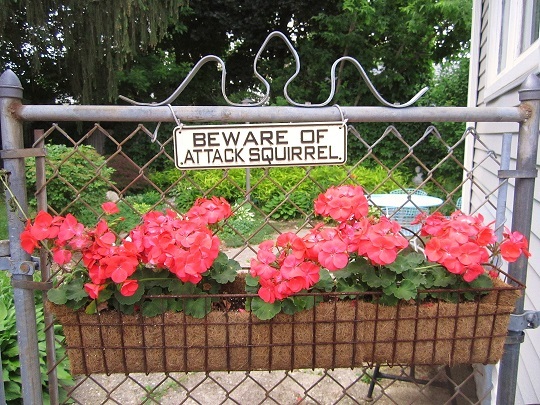 I love this on the back gate! Could these be any more beautiful! 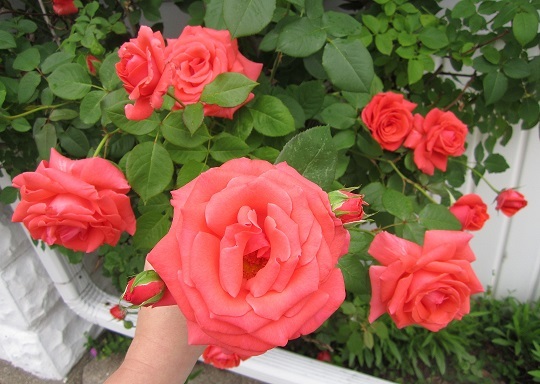 The color, the divine smell, this is the America rose. It's amazing, I don't do anything to this except clip the dead branches! 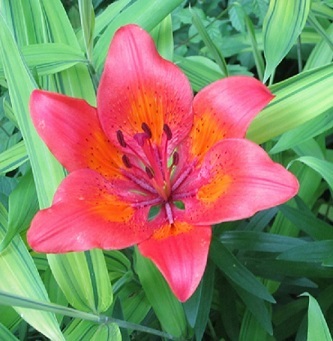 Look at the color of this lily! I dug it up from a house my brother used to have. I've always called it the mystery lily since at the time I had no idea what it looked like. Looks like I lucked out! 2 of my veggie gardens. 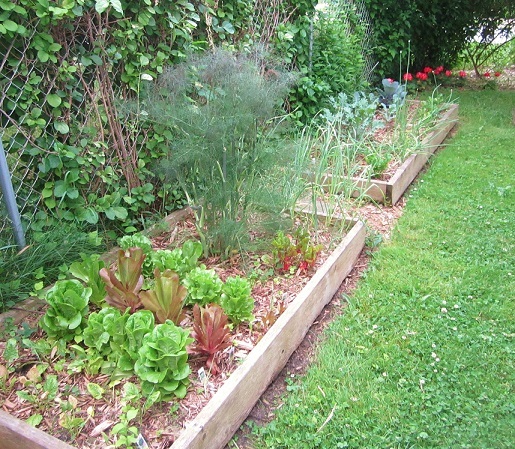 Lettuce, fennel, garlic, onion, chard, celery, broccoli, kale, cabbage, and lest I forget the giant fennel! I’ve been waiting to post this! I actually worked ahead last month since I had so many great red pieces. So, I’ve been enjoying this vignette in my dining room, and selling off some of the pieces for a couple weeks already. This has to be one of my favorite color of the months! There are so many pieces in this month's vignette that I love! 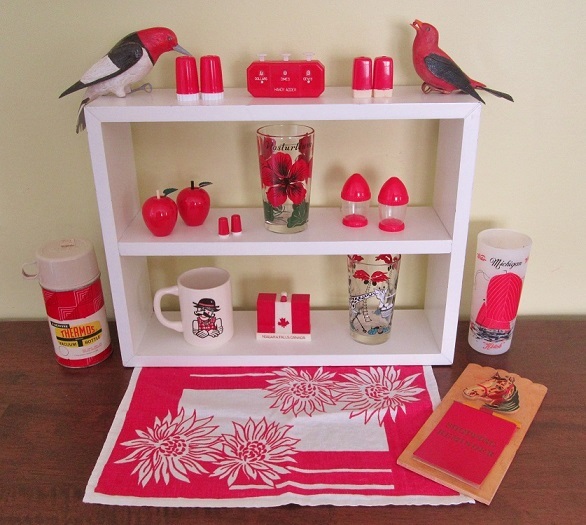 The little vintage napkin or placemat, horse grocery minder, NOS thermos, funny mug, Michigan sailboat glass, peanut butter nasturtium glass, shedds peanut butter glass, the bird models, and all the awesome salt and p's! Wow, the apple salt and p's, and those teeeny eeeeny little ones next to them! This is a favorite color of the month for sure! This is a unique and dazzling vintage tablecloth that I need to research the markings. 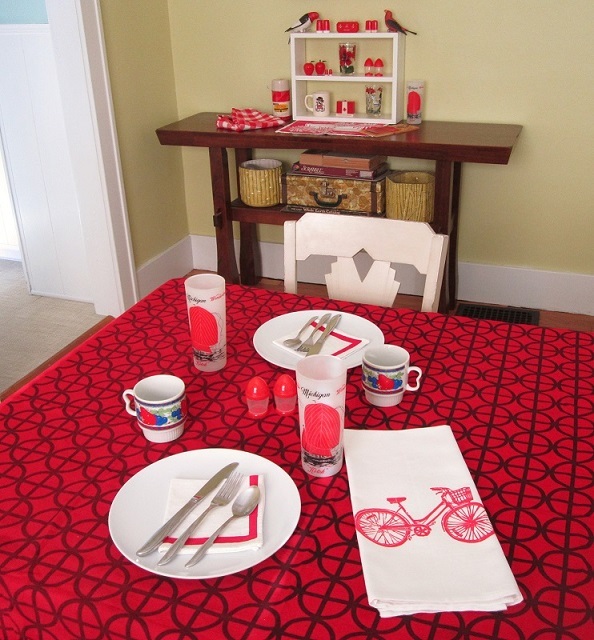 A pair of Japan vintage mugs, Michigan sailboat glasses, classic salt and p's, and plain white melmac plates with vintage red striped napkins, plus an artgoodies bike towel make the grade!